Octo Panic..Scrubs Green Deal | The Fringe | Conspiracy, News, Politics, and Fun Forum! Octo Panic..Scrubs Green Deal | The Fringe | Conspiracy, News, Politics, and Fun Forum! Octo Panic..Scrubs Green Deal The-Fringe | Your #1 Source For Conspiracy, News, Politics, and Fun! Catch, MaximalGravity, TheOrderOfChaos likes this! Anally Obsessive-Compulsive should SHUT DA FUUK UP! Too late - all these Democrat candidates jumped on board and they're all gonna be tarred with this Communist brush - which is what they all REALLY are. They revealed themselves. Catch, MaximalGravity, TheOrderOfChaos, WNC likes this! If you ever think the left is completely detached of reality, recent empirical evidence from "Tucker Carlson Tonight" seems to support your thinking. Rep. Alexandria Ocasio-Cortez's policy adviser joined Tucker Carlson last night to discuss specifics of her Green New Deal. When asked about peculiarities in documents surrounding said deal, Rep. Ocasio-Cortez's adviser Robert Hockett pretended those statements did not exist, a lie later seemingly endorsed by the congresswoman herself. 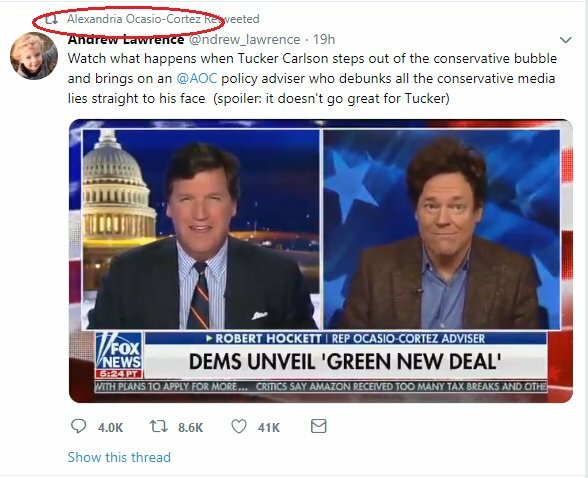 Media Matters for America's Andrew Lawrence tweeted the Hockett/Carlson exchange, saying, "Watch what happens when Tucker Carlson steps out of the conservative bubble and brings on an @AOC policy adviser who debunks all the conservative media lies straight to his face." 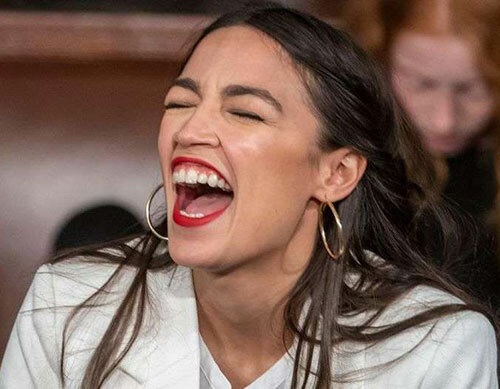 Hockett then asserted that "AOC has never said anything like that. I think you're referring to some sort of documents, I think some doctored documents, that somebody other than us has been circulating." "Oh, I thought that came right from, I thought that was in the backgrounder from her office, as I understand," Carlson responded clearly perplexed. "No, no," Hockett said shaking his head. "She tweeted it out to laugh at it. If you look at her latest tweets, it seems that some, apparently Republicans, have put it out there. I don't know the details." But, why would Rep. Ocasio-Cortez retweet Lawrence as if to support his belief Carlson had been proven incorrect. At best, Rep. Ocasio-Cortez and her team simply are not on the same page and she is unaware herself what the actual information put out said. At worst, Rep. Ocasio-Cortez and her team are lying to the American people. Democrat Rep. Alexandria Ocasio-Cortez has been caught brazenly lying to the public, claiming real quotes from her ‘Green New Deal’ are ‘fake’. On Friday, Tucker Carlson invited Cornell Universtiy professor, far-left activist and Ocasio-Cortez adviser Robert Hockett onto his show to debate the merits of the Green New Deal. Thegatewaypundit.com reports: Robert Hockett immediately told Tucker Carlson the document source he was reading from was doctored and not from Rep. Ocasio-Cortez’s website.